Employing, through its family of companies, approximately 126,500 employees in 60 countries, engaged in the research and development, manufacture and sale of a broad range of products in the healthcare field, Johnson & Johnson is the largest and most diversified healthcare company in the world. Johnson & Johnson’s product portfolio spans pharmaceuticals, consumer and medical devices – 389,000 products and product variations that touch more than one billion people every day. Promoting product quality and safety is thus a top priority. 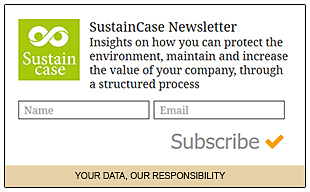 This case study is based on the 2014 Citizenship and Sustainability Report by Johnson & Johnson published on the Global Reporting Initiative Sustainability Disclosure Database that can be found at this link. Through all case studies we aim to demonstrate that CSR/ sustainability reporting done responsibly is achieved by identifying a company’s most important impacts on the environment and stakeholders and by measuring, managing and changing. In keeping with its credo commitment that everything it does must be of high quality, Johnson & Johnson continues to take steps to ensure consistent and sustained high-quality, safe and effective products. After measuring and setting targets, Johnson & Johnson took action to promote the standardization and implementation of Johnson & Johnson’s Quality Policy across its family of companies, promote compliance through a closed-loop, independent audit approach, achieve an integrated and proactive approach to quality, safety and continuous improvement – for example, a Management Review Process requires each of Johnson & Johnson’s operating company’s executive management to continuously improve quality by reviewing its Quality System every six months – and, also, use its expertise to influence and shape regulations. In its 2014 Citizenship and Sustainability Report Johnson & Johnson identified a range of material issues, such as access to and affordability of health care, global health, ethical performance, compliance, product pipeline. Among these, given the expanse of its product portfolio, its global presence and the highly regulated environment in which it operates, [tweetthis]promoting product quality and safety stands out as Johnson & Johnson’s top material issue[/tweetthis]. Stakeholder engagement at Johnson & Johnson is a constant, ongoing activity occurring at all levels of the organization. On any given day, Johnson & Johnson employees around the world engage with many different stakeholder groups that share Johnson & Johnson’s interests in advancing human health and well-being, stewarding a healthy environment and leading a dynamic and growing business responsibly. 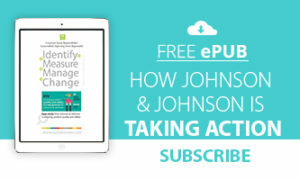 Johnson & Johnson’s ability to effectively participate in the engagement. In 2013, Johnson & Johnson conducted a Citizenship & Sustainability materiality assessment to identify those topics of greatest interest to both Johnson & Johnson and its stakeholders; specifically, those reflecting Johnson & Johnson‘s significant economic, environmental and social impacts and those that could substantively influence the assessments and decisions of stakeholders. In 2014, the materiality assessment conducted in 2013 was expanded to include input from a larger group of external stakeholders. Over 200 geographically diverse customers/healthcare providers, universities, suppliers, NGOs and investors were invited to provide input to the process. Responses received were aggregated with the external stakeholder responses received in 2013 and a revised ranking of the material issues was generated. 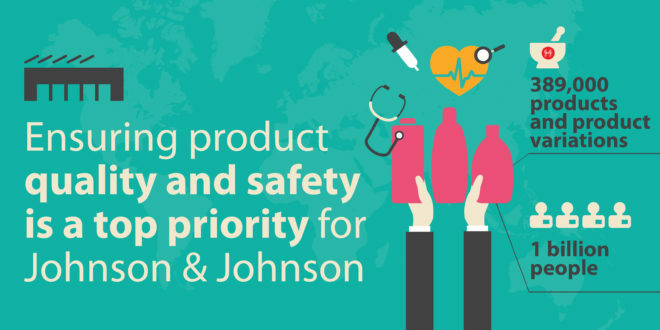 What actions were taken by Johnson & Johnson to promote product quality and safety? True to its decentralized business model, each member of the Johnson & Johnson Family of Companies maintains its autonomy to best serve its customers at the local level. However, Johnson & Johnson has integrated its total approach to Quality so that it can speak as one company to all its stakeholders, including health authorities, customers and healthcare professionals worldwide. Four years ago Johnson & Johnson formed the Johnson & Johnson Quality & Compliance (J&J Q&C) organization to ensure the standardization and consistent implementation of its Quality Policy and Quality Policy Standards across the Johnson & Johnson Family of Companies. The Johnson & Johnson Quality Policy governs Johnson & Johnson’s operating companies to help ensure they design, make and deliver Johnson & Johnson’s products in a consistent way. A three-phased approach to deploy a common set of Quality Policy Standards was two-thirds complete. Phase 1 deployment completed December 2013; phase 2 completed December 2014; phase 3 was on track for completion by December 2015. A closed-loop, independent audit approach is in place to help ensure facilities and external manufacturing sites operate in compliance to Johnson & Johnson’s Quality Policy and Quality Policy Standards, as well as health authority requirements. Johnson & Johnson has a clear and systematic process in place to remediate compliance gaps and minimize their impact on the customer experience. Results, current status and progress are all reported to business leaders and Johnson & Johnson company governing bodies to help them support their sites’ efforts to achieve compliance in a timely manner. In the first three-year cycle, all of Johnson & Johnson’s facilities have been audited. As part of the closed-loop audit program, all findings are tracked to successful completion. In 2015 the audit program was expanded to include external manufacturing sites, using a phased approach. Johnson & Johnson’s quality and continuous improvement approach includes a Management Review Process that requires each of Johnson & Johnson’s operating company’s executive management to continuously improve quality by reviewing its Quality System every six months to ensure its suitability, adequacy and effectiveness. Independent Quality Review Boards (Quality, Medical, Regulatory representation) within each business unit make decisions independent of commercial considerations to ensure they meet the high-quality standards expected of all Johnson & Johnson companies to do what’s right for Johnson & Johnson’s customers. As a result of these efforts, Johnson & Johnson has achieved an integrated and proactive approach to quality and continuous improvement. For the benefit of its customers, Johnson & Johnson continues to look at quality and safety throughout all phases of product life cycles. Health and safety impacts are assessed for all of Johnson & Johnson’s significant product categories in each business segment throughout the world. In addition, Chief Medical Officers are setting new benchmarks for medical safety and have implemented a consistent global approach for monitoring the use of in-market products. Johnson & Johnson is exploring new ways to continue to foster its proactive quality culture and use its expertise to engage in leadership roles with external stakeholders to influence and shape regulations, ensuring the Company continues to deliver safe and effective products to improve the lives of its patients and customers. In one example, Johnson & Johnson’s Pharmaceutical segment is piloting segment-wide metrics related to new leading indicators that the U.S. Food and Drug Administration (FDA) is considering to make requirements. Note to Johnson & Johnson: With each case study we send out an email to your listed address in request for a comment on this case study. If you have not received such an email please contact us.